Absolutely agree that we really have a forever changing world especially in the world market today. Coca-Cola Company has been around for so long and being known as a number one brand name for about 13 consecutive years. Coke is in the top of the list and value known as one of the powerful brands in the world for those long years and now replacing the Apple for being a number brand in the world market today. 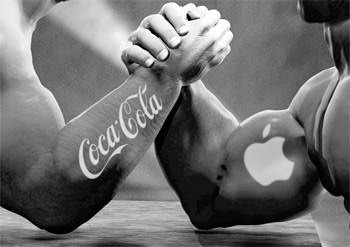 Is this means that people or the global market have change with their brands and priorities? The latest survey conducted shows that Apple products beat Coca-Cola and replace them as being number one powerful products globally and Coca-Cola dropped to the 3rd rank of being the top brand and Google is being the second. This shows that more people or marketers are interested in technology and gadgets these days. Since Steve Jobs discover and invented iPhone and iPad the world market change and this what brings the Apple products number one and overtaking Coca-Cola’s place for being number one product in the market. People would absolutely save money now just to get the newest gadgets that we have available today which is the iPad, Personal Apple Computers and iPhone or products made by Apple companies. A global chief executive explains that Apple’s placement to the top is a matter of time. We noticed that in this changing time, the technology companies are doing really well. Apple reached into an estimated amount of $98.3 billion while Coke has $79.2 billion and this starts with the Apple dynasty in this world market. Also Coca-cola is now in the 3rd rank of all the valuable product in the market while Google make it in the 2nd rank and Microsoft remain in the 5th rank and Samsung 8th and Intel in the 9th which shows technology companies are in the top of the list in the global market or in this innovative time replacing the soft drink of being number one brand.